Rajasthan Palaces Tour – Amidst the dry sands of Rajasthan, the spirit of the Rajputs lives on in the forts and palaces that have survived the ravages of time. While forts showcase their military prowess, the palaces reflect the Rajput’s zest for good living. Let’s start our tour with the Shekhwati region of Rajasthan, known for the grandeur and splendor of its magnificent palaces and havelis. Depending on time available, relax in hotel, shop, or go sightseeing. Delhi has a plethora of traditional markets, glitzy malls and state handicraft emporia for any kind of shopping you may be interested in. Delhi is also a heritage rich city with monuments like the Red Fort, Humayun’s Tomb and the Qutab Minar. Depart early morning for a 6 hour drive to Mandwa. Arrive in Mandwa and check into hotel. After lunch and some rest, visit the Mandwa Castle. The Shekhawati region comprises the districts of Sikar, Jhunjhunu and Churu. Mandwa lies at the heart of the Shekhawati region, and the Mandwa Castle is the jewel in its crown. This 240 year old fortress is now a 70 room heritage hotel. After breakfast, depart for Nawalgarh, 37 km south. Here, visit the fort built in 1737 and the havelis of Anandi Lal Poddar, Aath Haveli, Hem Raj Kulwal Haveli, Bhagton ki Haveli and Khedwal Bhavan. Enroute, visit Dundlod, 30 km known for Dundlod Fort and Palace, Goenka Haveli Jagathia Haveli and Tuganram; and Mukundgarh, 25 km south east known for its fort and mansions Break for lunch, and proceed to Parasrampura , 43 km southeast of Mandwa. Here there is a marvelous collection of paintings. Move on to Fatehpur which has been a Shekhawati stronghold since the 18th century. Some of the impressive mansions are Mahavir Prasad Goenka Haveli, Gauri Shankar Haveli, Nand Lal Devra Haveli, and Harikrishnan Das Sarogi Haveli apart from a boali dating back to the 17th century. After breakfast, depart for Bikaner, 200 km. Arrive in Bikaner, check into hotel. 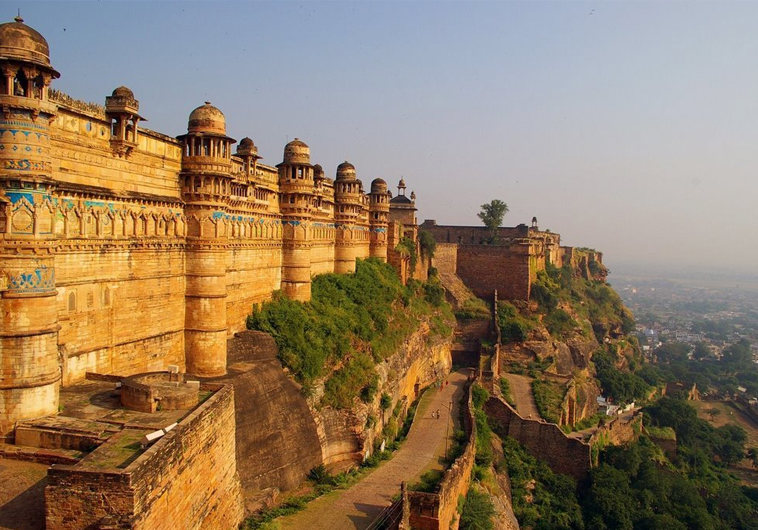 After lunch, visit Lalgarh Palace and Bikaner Fort. Lalgarh is a sandstone structure set amidst expansive lawns. Built by Maharaja Ganga Singh in memory of his father Maharaja Lal Singh, it sports a blend of Rajput, Mughal and European architecture. The walls are adorned with lattice and filigree work and the palace has a fine collection of paintings and hunting trophies. The property is partly a hotel. After an early breakfast, depart for Jaisalmer, 333 km. En route, visit the camel breeding farm. Arrive in Jaisalmer and check into hotel. Post lunch, take a guided tour of the havelis of merchants within Jaisalmer Fort. Notable ones are Salim Singh ki Haveli, Nathmal’s Haveli and Patwon ki Haveli. After breakfast, proceed to Jodhpur, 335 km. After lunch, visit the Umaid Bhawan Palace, Jodhpur. Inspired by European architecture, Maharaja Umaid Singh had this magnificent palace designed by Henry Vaughan Lanchester. 347 rooms make it the largest private residence in the world. Harmonious blend of the modern and the ancient, such as the Ramayana murals, a private museum and library, an indoor swimming pool, tennis and squash courts make it one of the finest palaces in the world, which has been converted partially into a five star deluxe hotel. After breakfast, visit Mandore, 10 km, the ancient capital of the Marwars. Interesting sights here are the Royal Cenotaphs, Ek Thamba Mahal, Hall of Heroes and the Ravan ki Chanvari. Proceed to Osian 50 km north to see beautifully sculpted Hindu and Jain temples which date back to the 8th and 12th centuries. After lunch, proceed to Rohetgarh 40 km. Here, besides the palace, now a hotel, you can go on a village safari and meet the Bishnoi tribe. Move on to visit the grand Sardar Samand Palace in Pali 30 km further south. Return to Jodhpur for overnight stay. Depart early for Udaipur, 280 km. Halt at Ranakpur, 162 km to see the beautiful Jain temples carved in marble. Arrive in hotel for night stay. After breakfast, take a tour of the majestic palaces of Udaipur, the Udaipur City Palace and the Lake Palace. The Lake Palace on Jag Niwas Island in Pichola Lake has a fairy-tale ambience. Built by Maharana Jagat Singh in 1743 as his summer palace, it is now a heritage hotel with 83 rooms including 17 beautiful suites and 53 deluxe rooms. The Udaipur City Palace overlooks the Pichola Lake and sports a fusion of European and Chinese architecture. It was built by Maharana Udai Singh of the Sisodia Rajput clan. Visit other attractions of Udaipur as well – Fateh Sagar Lake and Saheliyon ki Bari Time permitting, visit Eklingi temple, 25 km from Udaipur. Finely carved on stone, these temples are dedicated to Lord Shiva. After early breakfast, depart from Udaipur for Jaipur, 367 km. Halt at Nathdwara, 48km from Udaipur. Nathdwara is a temple dedicated to Sreenathji, or Krishna. Arrive in Jaipur, check into hotel for night stay. After breakfast, visit the Amer Palace and Jaipur City Palace. The Jaipur City Palace was built by Maharaja Jai Singh of the Kachwaha clan to shift the administration from Amer. The Amer Palace is a 16th century structure built by Raja Man Singh within the Amer/Amber fort complex. Visit other attractions of Jaipur – Hawa Mahal, Jantar Mantar, local markets. After lunch, proceed to Samode, 42 km from Jaipur. Samode Palace belongs to the Rawals of Samode, 400 yrs old and now a five star hotel Lavish interiors speak volumes of the Rajput royals – arched corridors, plastered blue tiles, high ceiling and walls richly carved in floral and geometric motifs, heavy silver furniture, and mirrors adorn this grand residence. Take a camel ride through Samode village and surrounding countryside. Fort of Sheogarh, Samode Bagh, a walled garden in the vicinity. Depart early for Delhi with a halt at Neemrana155 km. After lunch, proceed to Delhi, 122 km.